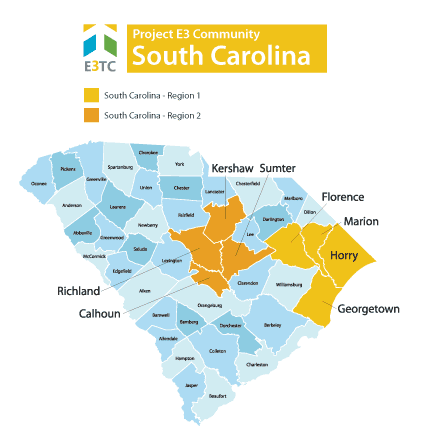 South Carolina is a location chosen as a targeted community through the Vocational Rehabilitation Technical Assistance Center: Targeted Communities (VR-TAC-TC) or Project E3. Project E3 will partner with State VR Agencies and local community partners to improve outreach and employment-related services to underserved people with disabilities in these communities. South Carolina is known for its 187 miles of coastline, beautiful lush gardens, historic sites and Southern plantations, and its growing economic development. The state’s Atlantic coastline is a popular destination for travelers. South Carolina is the 40th largest state in area and 23rd most populous state. Agriculture, including cotton, hay, and soybeans, as well as industry including textiles, chemical products, and paper products are important to the economy. Women over the age of 18 who have specific sensory impairments including blindness or other visual impairments, who are receiving Temporary Assistance for Needy Families (TANF), Supplemental Security Income (SSI), or Social Security Disability Insurance (SSDI). African-American males over the age of 18 who have specific sensory impairments, including blindness or other visual impairments. Engagement to provide consumers with information about South Carolina Commission for the Blind and South Carolina Vocational Rehabilitation Services and related community service providers. Employability Skills Training:Employability skills training increases a person’s ability to work with others and function socially. It also teaches them how to adjust to workplace expectations, including written and unwritten rules and social norms. Financial Literacy Training: The Make your Money Talk program will give clients the opportunity to develop personal money management skills and plan for their financial future. It is a three session personal finance education program. Counselor Motivational Interviewing (MI) Training: Provide opportunities for vocational rehabilitation counselors to access training on Motivational Interviewing. Motivational interviewing is an evidence-based counseling method used to help people resolve ambivalence and develop internal motivation to change behavior. Job Exploration Counseling: Job Exploration Counseling can include a variety of activities to help people explore and reach their career goals. Rehabilitation career counselors work with people with disabilities explore their interests and abilities, short- and long-term career goals, jobs available in the local economy, and issues related to disability and employment. Project E3 will provide South Carolina’s state Vocational Rehabilitation agencies and their partners with the skills and competencies needed to effectively and efficiently address barriers to competitive integrated employment and community integration encountered by persons with disabilities in these regions. We will leverage promising practices, knowledge, and experience gained from this project to expand employment opportunities for individuals with disabilities from underserved and economically disadvantaged populations throughout South Carolina and across the United States. By the end of the first year, 25 individuals from each region will apply or return to vocational rehabilitation services. By the end of the second year, approximately 18 individuals from each region will be found eligible for services. By the end of the second year, the number of people who complete an Individualized plan for employment will increase by 50%. Of those, there will be an increase in the cases closed in competitive, integrated employment by 25%. The project will develop a community consortium to direct, develop, and sustain services during the project and into the coming years.